The Holy Triduum-Three Days--begins on Holy Thursday with the Mass of the Lord's Supper at 7:30 p.m. At this Mass, we have the washing of the feet (and hands), the presentation of the holy oils, and, after Communion, the procession with the Blessed Sacrament to an altar of repose. 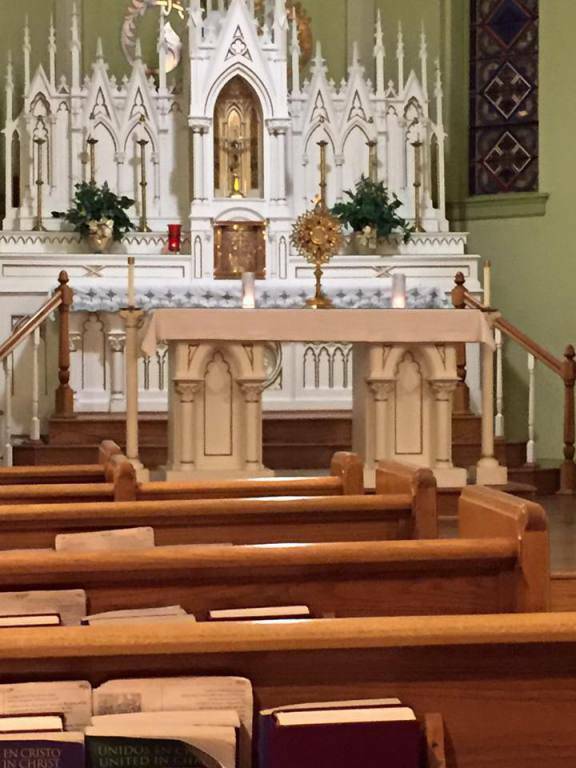 There people may pray before the Blessed Sacrament--keeping watch with the Lord in the garden--until Night Prayer at 11:00 p.m. The 2nd Day--Good Friday--finds us praying at 2:00 p.m. with the Proclamation of the Passion, veneration of the cross, and Holy Communion. The Hispanic Community will lead an outdoor Stations of the Cross at 5:00 p.m. The 3rd Day--Holy Saturday/Easter Sunday--will find us beginning our prayer at 9:00 p.m. for the Easter Vigil. At this Liturgy--the high point Liturgy in Catholicism--the Easter fire is blessed, the Exultant is proclaimed and all the men, women & children who have been preparing for the Easter Sacraments will be received fully into the Church. On Easter Sunday, the Masses will be at 8:00 a.m., 10:00 a.m. & 12:30 p.m.
El Triduo Santo - Tres días - comienza el Jueves Santo con la Misa de la Cena del Señor a las 7:30 p.m. En esta Misa, tenemos el lavado de los pies (y las manos), la presentación de los santos aceites y, después de la comunión, la procesión con el Santísimo Sacramento a un altar de reposo. Allí las personas pueden orar ante el Santísimo Sacramento, vigilando al Señor en el jardín, hasta la Oración de la noche a las 11:00 p.m.
El segundo día, Viernes Santo, nos encuentra rezando a las 2:00 p.m. Con la Proclamación de la Pasión, la veneración de la cruz y la Sagrada Comunión. La comunidad hispana dirigirá las estaciones de la cruz al aire libre a las 5:00 p.m.
El tercer día, Sábado Santo / Domingo de Pascua, nos encontrará comenzando nuestra oración a las 9:00 p.m. para la Vigilia de Pascua. En esta liturgia, el punto más alto de la liturgia en el Catolicismo, el fuego de la Pascua es bendecido, el Exultante es proclamado y todos los hombres, mujeres y niños que se han estado preparando para los Sacramentos de la Pascua serán recibidos en la Iglesia. El domingo de Pascua, las misas serán a las 8:00 a.m., 10:00 a.m. y 12:30 p.m.
We, the people of St. Ambrose Catholic Church, are called to live the Gospel message of God’s love and mercy. We live our faith through worship, prayer, faith formation, and as a loving servant to those in need both in our parish and the larger community. Our liturgy, through the celebration of the Sacraments together. Life long faith formation through St Ambrose Catholic School, religious education programs, youth ministry, and adult education. Christian service by ministering to the needs of the parish, the larger community and the world. Good stewardship of our finances and parish resources. Eucharistic adoration begins at the conclusion of the 8:45 a.m. Mass and runs throughout the day, concluding with Evening Prayer and benediction at 8:45 p.m. When you shop at smile.amazon.com you can generate donations for St Ambrose Catholic Church Seymour Inc. Amazon has a large variety of gifts including electronics, jewelry, clothing, and more. 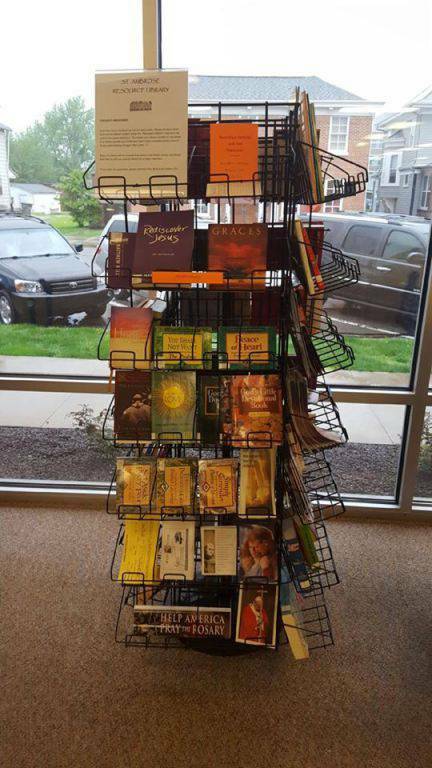 Check out the new St. Ambrose Resource Library display in the entrance of Parish Center. 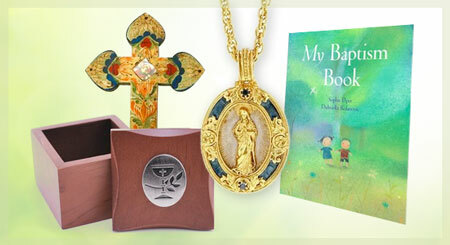 There are many books to choose from including the following topics: Catechism, Saints, Bible Reference, Teens, Parenting, Catholic Living, Popes, Prayer, DVDs, Children’s books and many more. Checkout Instructions are posted in both English and Spanish. Please see our upstairs resource center for an even bigger selection! Sunday/Domingo 8:00 a.m. 10:00 a.m.